There is a spike in anti-Islam videos regarding this topic. Now after studying this carefully, I think we have a good argument for why Prophet Muhammad, peace be upon him, at one point ordered the killing of all dogs, except for the ones kept as hunting and/or guard ones in Medina. This was obviously and epidemic that needed to be cured. And here in the West and throughout the world, they still do this practice. If a dog is not adopted from the animal shelter, it will eventually get euthanized. • The pack mentality. Three dogs are worse than 2, 4 are worse than 3, etc. Docile dogs often become uncharacteristically violent and vicious when they are in a pack. In 2013, 15 of the 37 canine homicides were caused by two or more dogs. (Kenneth M. Phillips, Canine Homicides: July 2006 to the Present, accessed 5/25/2013). - Well in the first place they are bred from dangerous predators that can (in a pack) take down a moose. - So if your dog, which is a subspecies of wolf, does not regard you as a packmate, you can be in big trouble. - Dogs can be dangerous when they are large and strong enough to overpower you and aggressive enough to attack you. Some have bites that are very hard to break, which is a problem if they’re able to knock you off your feet and worry at your throat. They can also form packs, which can multiply the danger. Keep in mind that people were primitive back then, and a society that is plagued with stray animals suffered a lot of diseases. So killing of all dogs, except for keeping ones as guard and/or hunting dogs was not a bad idea after all. Muslims don't sleep with animals on beds because they are concerned about their status as being clean and pure. However, this doesn't mean they hate dogs. 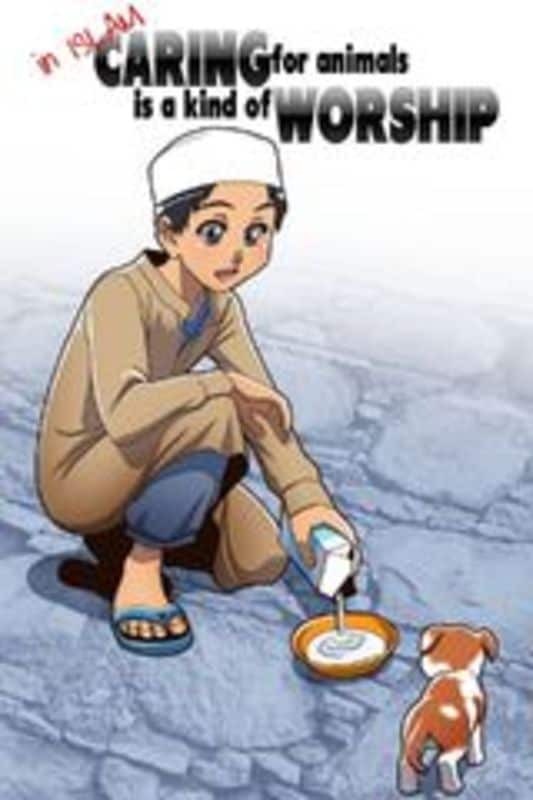 Once, the Prophet Muhammad spoke of God’s forgiveness due to the humane treatment of animals.He told his companions the story of a man who got thirsty on his way. He found a well, climbed down inside it to the water, and quenched his thirst. When he came out he saw a panting dog licking on mud out of extreme thirst. The man thought to himself, ‘The dog has become as thirsty as I was!’ The man went down the well again and got some water for the dog. God appreciated his good work and forgave him. "There is a reward in (doing good to) every living being." The instruction to kill street dogs in the town of Madina was only for a certain period. As for Muslims that opt to keep dogs as pet will have their daily rewards lessen. The reason for killing dogs at that time was due to number of dogs being high in the town, and so they minimize the number of (unclean) animal especially the black ones. "I was one of those who held up the branches from the tree away from the face of the Messenger of Allah (ﷺ) while he was delivering the Khutbah saying: 'If it were not that dogs were a nation among nations, then I would order that they be killed. So kill every one among them that is all black. There is one inhabiting a home in which they keep a dog but their deeds are decreased by one Qirat every day - except for a hunting dog, or a farm dog, or a sheep dog.'" 1- The African wild dogs, which eat their prey alive. 2- Possibly hyenas. They do belong to the canine species. Their claws are dull, like all canines, and they only fight with their jaws. Cats have curved claws, and they fight with their four claws and mouths/jaws. These mentioned animals are also desert animals. So black dogs definitely include those, in my opinion. So most probably, the worst of the dogs back then were probably aliased as "black dogs". Like our pitbulls of today (banned in England), the worst of the dogs back then were probably referred to as "black dogs" in the Middle East. I don't think this was due to the actual color (like black=evil), but rather due to the fact that the much darker dogs were certainly the most feared if we include the African wild dogs and hyenas. This makes perfect sense for me. I don't know why some foolish anti-Muslims complained about killing dogs in Islamic sources, but don't forget that Asian countries eat dog meats. I heard a lot of pro-dog activists demanded Chinese and Korean governments to ban dog meats. Also, I heard last year that there was a big food festival for dog meats in China, but I don't know how many dogs were slaughtered.